1938　Hiroyoshi Hamamoto was born in Saga. 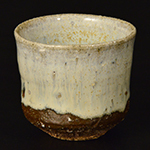 1969　Learned ceramic art in Karatsu for 13 years. 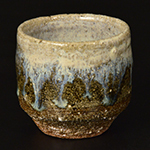 1982　Became independent and built his own kiln, and also worked on reconstruction of early Karatsu ware. 1986　Holds solo exhibitions at Shibuya Kurodatoen since this year.